You can hear the snow melt! We were staying in La Plagne, we'd probably climbed for nomore than half an hour from resort when Luke held his finger up, "shhh, listen", he said. I listened, "I don't hear anything", I told him. "That's just the point, we've hardly left the ski resort and you can hear... nothing, silence, deep, profound silence. You don't get that anywhere else, even in the countryside there is the noise of a tractor, the buzz of insects, the beating of tyres on some distance road, but here the silence is total, you can hear the snow melt beneath your skis." For Luke, that his reason for going off-piste. You may have others, the challenge of skiing virgin powder or the beauty of curves cut through spring snow, or of conquering peaks on touring equipment. George Leigh Mallory reduced it to the absolute because it is there when asked why he wanted to climb Mt Everest. I first went skiing in Le Mont Dore in 1975 when I was 11 years old and was instantly hooked. There's something about the clean white snow, the majestic peaks, snowy pine forests that for me is just magic. 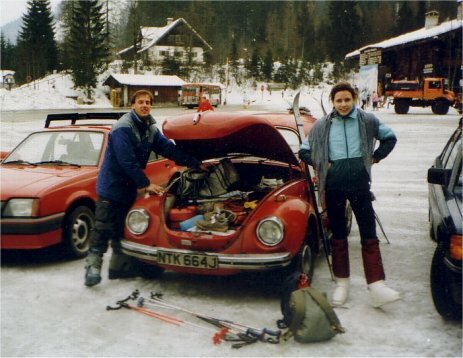 In the later part of the 1980s I went to live in Bavaria in Southern Germany and, despite the fact that sometimes snow depths were more imaginary than real, I was off skiing every weekend I could. All the same I used to look enviously at French resorts posting 3+ meters at the summit whereas somewhere like Lengries would have more like 40cm. So in 1991 I moved to France where, apart from a season in Davos in Switzerland I have lived. I have also done a season in Chamonix Mont Blanc and spent two years in Grenoble and a number of winters in and around Chambery. I am now living in the French Alps between Grenoble and Chambery. Under various guises I've been a regular contributor to the newsgroups rec.skiing and later rec.skiing.resorts.europe since the early 1990s. Over the years I've written a number of articles about skiing and other mountain activities, this site is an attempt to organise that work. The focus of this site is on off-piste snowsports in France. For general facts and useful information about France and European skiing check out the rsre FAQ. Many of the skiing related sites on the Web are commercial and present the ski business point of view. www.ifyouski.com and www.hiver.com are good starting points. However both have their limitations, ifyouski has limited range of resorts and has a definite ski biz bias. Hiver is as extensive as is it is inaccurate. I'm also looking for contributions. If you've surfed the other pages you should get an idea of the style. I'm looking for information on French resorts and and off-piste routes. Good accommodation in resort, especially phone/fax/web addresses. If you don't know them look them up on vie the French White Pages. How to get to the resort Good guides or ski schools offering off-piste skiing Off-piste skiing routes, ski tours etc. General resort descriptions, interesting history etc. What's this, is PisteHors going all commercial on us? Well you wouldn't believe how much it costs to run a site like this. We've recently affiliated with some top class ski shops to help you find the backcountry equipment you need. Please use this service as it helps keep PisteHors accurate and up-to-date. We only suggest shops that we ourselves use or that have been recommended. Some of the route suggestions have come from friends, guides or locals and are included for completeness. The difficulty of an individual route can vary enormously with the current snow conditions so no specific guidance is included. The right of contributors of PisteHors.com to be identified as the authors of these works has been asserted in accordance with the Copyright, Design and Patents act. Permission is granted for short quotations or the use of figures, images and tables for educational or scientific purposes. Please contact us for all other use. Member of Mountain Wilderness, France and ANENA, the French Avalanche Research Organisation.